A thorough knowledge of the root canal anatomy and its variations is required for achieving success in root canal therapy, along with diagnosis, treatment planning and clinical expertise. ,,, One such variation of the root canal system is the C-shaped canal configuration. It is termed so because of the C-shaped cross-sectional anatomical configuration of the root and root canal. This condition was described for the first time in literature by Cooke and Cox  in 1979, though Weine et al.,  reported that several clinicians had suggested its presence in lectures earlier. Manning in his description of root canal anatomy of mandibular second molars, stated that C-shaped roots and root canals were first documented in 1908 and 1911, after examination of the skeletal remains of members of the Neanderthal race, which were predecessors of the Mongoloid race that includes Asian populations. Numerous incidence studies prove the racial predilection of this variation. ,,,,,,,,,,,,,,,,,,,,,,, Though most commonly found in mandibular second molars, ,,,,,,,,,,,,,,,,,,,, the C-shaped canal configuration may also occur in mandibular premolars, ,,,,, maxillary molars, , and mandibular third molars. , The C-shaped canal configuration presents with variations in both the number and location of the canal(s), as the canal(s) courses from the coronal to the apical third. The complexity of this canal configuration proves to be a challenge with respect to debridement and obturation and possibly the prognosis during root canal therapy. , Recognition of a C-shaped canal configuration before treatment can facilitate effective management, which will prevent irreparable damage that may put the tooth in severe jeopardy. , The aim of this article is to discuss the etiology, incidence, anatomic features, classification, diagnosis and management of the C-shaped canal configuration. Manual and electronic searches of literature were performed from 1979 to 2012, in PubMed by crossing the keywords: C-shaped canals, mandibular second molar, mandibular first premolar, root canal morphology. The following are the pertinent features in relation to the external root anatomy and configuration of the pulp chamber and the root canal system usually found in C-shaped mandibular molars, though similar features may be found in C-shaped maxillary molars and mandibular premolars. A conical or square configuration is characteristic of roots having a C-shaped canal. , The root configuration of molars having this canal shape may be represented by fusion of either the facial or lingual aspect of the mesial and distal roots. The roots display an occluso-apical groove on the buccal or lingual surface, which represent the line of fusion between mesial and distal roots. The surface opposite this radicular groove is convex. Peiris et al.,  referred to the C-shaped roots of mandibular second molars as being 'gutter-shaped'. The root canal system of C-shaped canals shows broad, fan-shaped communications from the coronal to the apical third of the canal. The canal(s) change shape from the coronal aspect of the root. For example: A continuous C-shaped canal would change to a semicolon configuration in the midroot and then becomes continuous C-shape in the apical third of the root or vice versa. Accessory and lateral canals, inter-canal communications and apical delta can be found in a prevalence of 11-41%, in the apical region of C-shaped canals. Cross-sectional C-shaped canal morphology reveals thinner lingual walls than buccal with the lowest value measured being 0.26 mm. 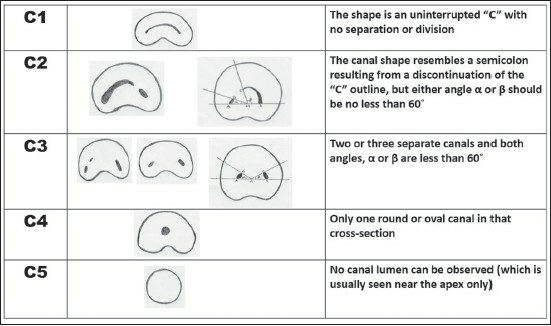 The varied intricacies in the C-shaped canal anatomy are outlined in the section on classification. A preoperative radiograph usually provides various clues in the identification of any variation in root canal morphology. However, there are differences in opinions on the value of a preoperative radiograph in diagnosing a C-shaped case. Cooke & Cox  were of the opinion that it is not possible to diagnose C-shaped canals on preoperative radiographs. Conversely, some investigators described four radiographic characteristics that can allow prediction of the existence of this anatomical condition: radicular fusion, radicular proximity, a large distal canal or a blurred image of a third canal in between. , Hence, a C-shaped root in a mandibular second molar may present radiographically as a single-fused root or as two distinct roots with a communication. , When the communication or fin connecting the two roots is very thin, it is not visible on the radiograph and may thus give the appearance of two distinct roots. The radiograph may also reveal a large and deep pulp chamber, usually found in C-shaped molars. , Fan et al.,  divided the radiographic appearance that the C-shaped teeth are present with three types [Figure 1]a]. In type I, the C-shaped canal system actually appears as two distinct canals, because the isthmus that links the mesial and distal "main" canals is very thin and hence is not detected radiographically. In the radiographic type II, the mesial and distal canals assume their own individual course to the apex. Thus, there are apparently two distinct canals on the radiograph. 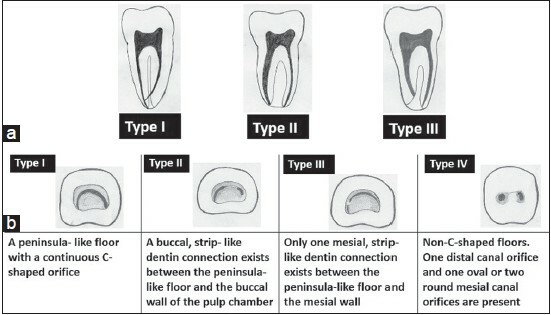 In type III, one canal continues its course to the apex giving the image of a distinct canal whereas the other(s) proceeds very close to or within the fused area, that is, the "web" between the two main roots in the apical third. Hence, the canal may seem to exit into the groove radiographically. Wang et al.,  reported a higher incidence in the recognition of C-shaped canals using a combination of radiography and clinical examination under the microscope (41.27%) than using the radiography (34.64%) or clinical examination (39.18%) alone. At least one cross-section of the canal should belong to the C1, C2, or C3 configuration, as per Fan's anatomic classification [Figure 2]. Obtaining a three dimensional fill of a C-shaped canal may prove to be a problem due to the various intricacies present within the root canal system. If a cold condensation technique is adopted for obturation, deeper penetration of condensation instruments in several sites will be necessary. To ensure proper placement of the master cones in C-shaped canals, Barnett  recommended placing a large diameter file in the most distal portion of the canal, before seating the master cone in the mesial canal. The file is then withdrawn and the master cone of the distal canal is seated, followed by placement of accessory cones in the middle portion of the C-shaped canal. Studies have shown that following the cleaning and shaping, the remaining dentin thickness around the canals is usually 0.2 to 0.3 mm. The resultant forces of compaction during obturation can exceed the dentin canal resistance, which may result in root fracture and perforation of the root. ,, In this regard, the thermoplasticized gutta-percha technique may prove to be more beneficial. The aim of this technique is to move the gutta-percha and sealer into the root canal system under a hydraulic force. But in C-shaped canals the hydraulic forces can dramatically decrease and can seriously compromise the obturation quality due to the following reasons: (a) there are divergent areas that are frequently unshaped, which may offer resistance to obturating material flow (b) communications exist between the main canals of the C-shape through which the entrapped filling materials that should be captured between the apical tug back area and the level of condensation may pass from one canal to another. Walid's technique  aimed to overcome these problems. This technique involves placing the master points simultaneously in the C-shaped canal. A large plugger is placed on one of the seared master points while the other master point is down packed with a smaller plugger. This increases the resistance towards the passage of obturating material from one canal to another. The smaller plugger is then held in place while the other point is down packed. This offers backpressure on entrapped filling materials and enhances the seal. Ordinola- Zapata et al.,  analyzed gutta-percha filled area of C-shaped canals filled with Maggiore's modified MicroSeal technique with reference to the radiographic features. They found that the apical third was less accurately filled and concluded that C2 canals with a 60° angle could be less difficult to fill than a 120° or 150° C2 canal. The C-shaped root canal configuration has an ethnic predilection and a high prevalence rate in mandibular second molars. Understanding the anatomical presentations of this variation will enable the clinician to manage these cases effectively. 1. Manning SA. Root canal anatomy of mandibular second molars. Part I: Int Endod J 1990;23:34-9. 2. Melton DC, Krell KV, Fuller MW. Anatomical and histological features of C-shaped canals in mandibular second molars. J Endod 1991;17:384-8. 3. Sidow SJ, West LA, Liewehr FR, Loushine RJ. Root canal morphology of human maxillary and mandibular third molars. J Endod 2000;26:675-8. 4. Chai WL, Thong YL. Cross-sectional morphology and minimum canal wall widths in C-shaped roots of mandibular molars. J Endod 2004;30:509-12. 5. Rahimi S, Shahi S, Lotfi M, Zand V, Abdolrahimi M, Es'haghi R. Root canal configuration and the prevalence of C-shaped canals in mandibular second molars in an Iranian population. J Oral Sci 2008;50:9-13. 6. Cooke HG 3rd, Cox FL. C-shapedcanal configurations in mandibular molars. J Am Dent Assoc 1979;99:836-9. 7. Weine FS. The C-shaped mandibular second molar: Incidence and other considerations. Members of the Arizona Endodontic Association. J Endod 1998;24:372-5. 8. Manning SA. Root canal anatomy of mandibular second molars. Part II: C-shaped canals. Int Endod J 1990;23:40-5. 9. Yang ZP, Yang SF, Lin YC, Shay JC, Chi CY. C-shaped root canals in mandibular second molars in a Chinese population. Endod Dent Traumatol 1988;4:160-3. 10. Haddad GY, Nehme WB, Ounsi HF. Diagnosis, classification, and frequency of C-shaped canals in mandibular second molars in the Lebanese population. J Endod 1999;25:268-71. 11. Gulabivala K, Aung TH, Alavi A, Ng YL. Root and canal morphology of Burmese mandibular molars. Int Endod J 2001;34:359-70. 12. Al-Fouzan KS. C-shaped root canals in mandibular second molars in a Saudi Arabian population. Int Endod J 2002;35:499-504. 13. Gulabivala K, Opasanon A, Ng YL, Alavi A. Root and canal morphology of Thai mandibular molars. Int Endod J 2002;35:56-62. 14. Seo MS, Park DS. C-shaped root canals of mandibular second molars in a Korean population: Clinical observation and in vitro analysis. Int Endod J 2004;37:139-44. 15. Jin GC, Lee SJ, Roh BD. Anatomical study of C-shaped canals in mandibular second molars by analysis of computed tomography. J Endod 2006;32:10-3. 16. Ahmed HA, Abu-bakr NH, Yahia NA, Ibrahim YE. Root and canal morphology of permanent mandibular molars in a Sudanese population. Int Endod J 2007;40:766-71. 17. Peiris R, Takahashi M, Sasaki K, Kanazawa E. Root and canal morphology of permanent mandibular molars in a Sri Lankan population. Odontology 2007;95:16-23. 18. Peiris HR, Pitakotuwage TN, Takahashi M, Sasaki K, Kanazawa E. Root canal morphology of mandibular permanent molars at different ages. Int Endod J 2008;41:828-35. 19. Al-Qudah AA, Awawdeh LA. Root and canal morphology of mandibular first and second molar teeth in a Jordanian population. Int Endod J 2009;42:775-84. 20. Neelakantan P, Subbarao C, Subbarao CV, Ravindranath M. Root and canal morphology of mandibular second molars in an Indian population. J Endod 2010;36:1319-22. 21. Zhang R, Wang H, Tian YY, Yu X, Hu T, Dummer PM. Use of cone-beam computed tomography to evaluate root and canal morphology of mandibular molars in Chinese individuals. Int Endod J 2011;44:990-9. 22. Zheng Q, Zhang L, Zhou X, Wang Q, Wang Y, Tang L, et al. C-shaped root canal system in mandibular second molars in a Chinese population evaluated by cone beam computed tomography. Int Endod J 2011;44:857-62. 23. Wang Y, Guo J, Yang HB, Han X, Yu Y. Incidence of C-shaped root canal systems in mandibular second molars in the native Chinese population by analysis of clinical methods. 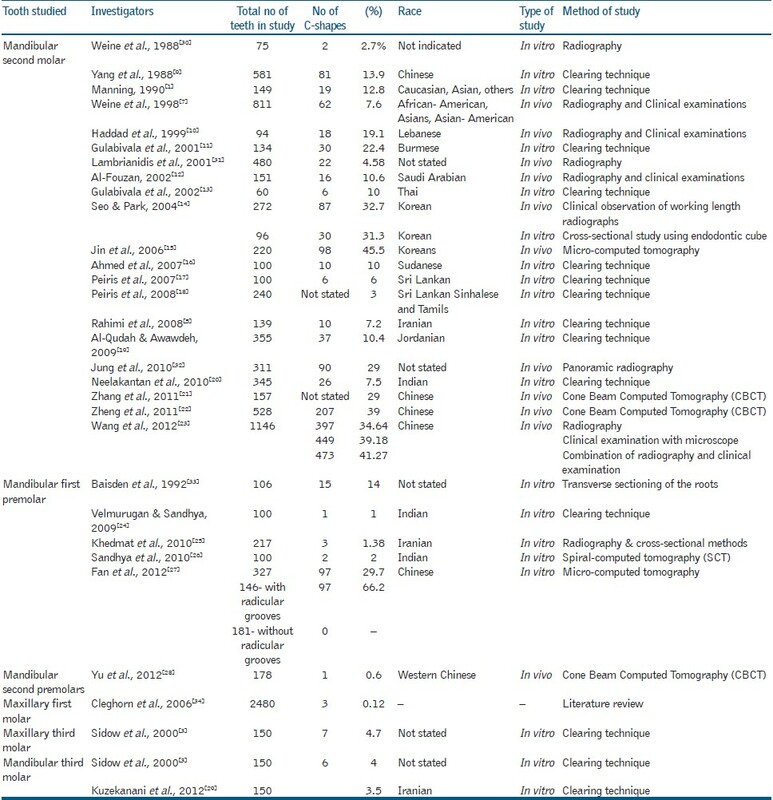 Int J Oral Sci 2012;4:161-5. 24. Velmurugan N, Sandhya R. Root canal morphology of mandibular first premolars in an Indian population: A laboratory study. Int Endod J 2009;42:54-8. 25. Khedmat S, Assadian H, Saravani AA. Root canal morphology of the mandibular first premolar in an Iranian population using cross-sections and radiography. J Endod 2010;36:214-7. 26. Sandhya R, Velmurugan N, Kandaswamy D. Assessment of root canal morphology of mandibular first premolars in the Indian population using spiral computed tomography: An in vitro study. Indian J Dent Res 2010;21:169-73. 27. Fan B, Ye W, Xie E, Wu H, Gutmann JL. Three-dimensional morphological analysis of C-shaped canals in mandibular first premolars in a Chinese population. Int Endod J 2012;45:1035-41. 28. Yu X, Guo B, Li KZ, Zhang R, Tian YY, Wang H, et al. Cone-beam computed tomography study of root and canal morphology of mandibular premolars in a western Chinese population. BMC Med Imaging 2012;12:18. 29. Kuzekanani M, Haghani J, Nosrati H. Root and canal morphology of mandibular third molars in an Iranian population. J Dent Res Dent Clin Dent Prospects 2012;6:85-8. 30. Weine FS, Pasiewicz RA, Rice RT. Canal configuration of the mandibular second molar using a clinically oriented in vitro method. J Endod 1988;14:207-13. 31. Lambrianidis T, Lyroudia K, Pandelidou O, Nicolaou A. Evaluation of periapical radiographs in the recognition of C-shaped mandibular second molars. Int Endod J 2001;34:458-62. 32. Jung HJ, Lee SS, Huh KH, Yi WJ, Heo MS, Choi SC. Predicting the configuration of a C-shaped canal system from panoramic radiographs. Oral Surg Oral Med Oral Pathol Oral Radiol Endod 2010;109:e37-41. 33. Baisden MK, Kulild JC, Weller RN. Root canal configuration of the mandibular first premolar. J Endod 1992;18:505-8. 34. Cleghorn BM, Christie WH, Dong CC. Root and root canal morphology of the human permanent maxillary first molar: A literature review. J Endod 2006;32:813-21. 35. Fan B, Cheung GS, Fan M, Gutmann JL, Fan W. C-shaped canal system in mandibular second molars: Part II: Radiographic features. J Endod 2004;30:904-8. 36. Orban B, Mueller E. The development of bifurcation of multirooted teeth. J Am Dent Assoc 1929;16:297-319. 37. Barnett F. Mandibular molars with C-shaped canal. Endod Dent Traumatol 1986;2:79-81. 38. Fischlschweiger W, Clausnitzer E. Root formation in molar teeth of the CD-1 mouse. J Endod 1988;14:163-8. 39. Carlsen O, Alexandersen V, Heitmann T, Jakobsen P. Root canals in one-rooted maxillary second molars. Scand J Dent Res 1992;100:249-56. 40. Singla M, Aggarwal V. C-Shaped palatal canal in maxillary second molar mimicking two palatal canals diagnosed with the aid of spiral computerized tomography. Oral Surg Oral Med Oral Pathol Oral Radiol Endod 2010;109:e92-5. 41. Gu Y. A micro-computed tomographic analysis of maxillary lateral incisors with radicular grooves. J Endod 2011;37:789-92. 42. Sabala CL, Benenati FW, Neas BR. Bilateral root or root canal aberrations in a dental school patient population. J Endod 1994;20:38-42. 43. Jerome CE. C-shaped root canal system: Diagnosis, treatment and restoration. Gen Dent 1994;42:424-7. 44. Cheung GS, Yang J, Fan B. Morphometric study of the apical anatomy of C-shaped root canal systems in mandibular second molars. Int Endod J 2007;40:239-46. 45. Lu TY, Yang SF, Pai SF. Complicated root canal morphology of mandibular first premolar in a Chinese population using the cross section method. J Endod 2006;32:932-6. 46. Fan B, Yang J, Gutmann JL, Fan M. Root canal systems in mandibular first premolars with C-shaped root configurations. Part I: Microcomputed tomography mapping of the radicular groove and associated root canal cross-sections. J Endod 2008;34:1337-41. 47. Fan B, Cheung GS, Fan M, Gutmann JL, Bian Z. C-shaped canal system in mandibular second molars: Part I: Anatomical features. J Endod 2004;30:899-903. 48. Fan B, Chen WX, Fan MW. Configuration of C-shaped canals in mandibular molars in Chinese population. J Dent Res 2001;80:704. 49. Gao Y, Fan B, Cheung GS, Gutmann JL, Fan M. C-shaped canal system in mandibular second molars part IV: 3-D morphological analysis and transverse measurement. J Endod 2006;32:1062-5. 50. Min Y, Fan B, Cheung GS, Gutmann JL, Fan M. C-shaped canal system in mandibular second molars Part III: The morphology of the pulp chamber floor. J Endod 2006;32:1155-9. 51. Ricucci D, Pascon EA, Langeland K. Long-term follow-up on C-shaped mandibular molars. J Endod 1996;22:185-7. 52. Kottoor J, Velmurugan N, Ballal S, Roy A. Four-rooted maxillary first molar having C-shaped palatal root canal morphology evaluated using cone-beam computerized tomography: A case report. Oral Surg Oral Med Oral Pathol Oral Radiol Endod 2011;111:e41-5. 53. Fan B, Min Y, Lu G, Yang J, Cheung GS, Gutmann JL. Negotiation of C-shaped canal systems in mandibular second molars. J Endod 2009;35:1003-8. 54. Walid N. The use of two pluggers for the obturation of an uncommon C-shaped canal. J Endod 2000;26:422-4. 55. Jafarzadeh H, Wu YN. The C-shaped root canal configuration: A review. J Endod 2007;33:517-23. 56. Cheung LH, Cheung GS. Evaluation of a rotary instrumentation method for C-shaped canals with micro-computed tomography. J Endod 2008;34:1233-8. 57. Yin X, Cheung GS, Zhang C, Masuda YM, Kimura Y, Matsumoto K. Micro-computed tomographic comparison of nickel-titanium rotary versus traditional instruments in C-shaped root canal system. J Endod 2010;36:708-12. 58. Solomonov M, Paqué F, Fan B, Eilat Y, Berman LH. The challenge of C-shaped canal systems: A comparative study of the self-adjusting file and ProTaper. J Endod 2012;38:209-14. 59. Ruddle JC. Three-dimensional obturation of the root canal system. Dent Today 1992;11:28, 30-3, 39. 60. Ordinola-Zapata R, Bramante CM, de Moraes IG, Bernardineli N, Garcia RB, Gutmann JL. Analysis of the gutta-percha filled area in C-shaped mandibular molars obturated with a modified MicroSeal technique. Int Endod J 2009;42:186-97. 61. Caputo AA, Standlee JP. Pins and posts: Why, when and how. Dent Clin North Am 1976;20:299-311.